Cross beam is a supporting auxiliary for MAXIMA Heavy Duty Column. 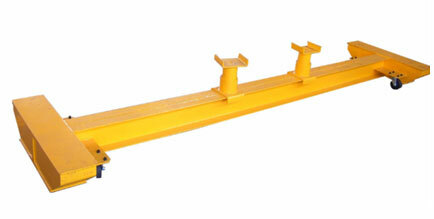 It’s used for supporting and lifting the front & rear axles of vehicles. Ramping platform ML4022PT is a supporting auxiliary for MAXIMA Heavy Duty Column Lift ML4030/ML4030W. It can facilitate vehicles quick drive-on & drive-off, and thus enhancing working efficiency to a large extent. ◆ Providing a fast, convenient and smooth parking space for vehicles to be repaired. ◆ Parking of vehicle is firm and reliable, with parking block warding off in front. ◆ During columns lifting up and down, the turnable parking block wards off the vehicle in good reliability at rear end.